Safety is a homeowner’s top priority. Qualified 24/7 electricians are experienced in making sure the new lighting does not overload the electrical system and that all of the connections are safe and secure. At Top Flight Electric, our 24/7 electricians are always on call in the event you have a question or concern. The last thing you want is to install landscape lighting only to find out that your electric bill skyrockets as a result. Electrical contractors are well-versed in lighting options that are both efficient and add beauty and ambiance to your outdoor area. Electrical contractors often spot potential electrical issues before they arise. They can also easily troubleshoot problems, check connectivity, test voltage and make sure your outdoor lighting is operating at optimal levels. And, there is no greater peace of mind than having access to a 24/7 electrician should a question arise. Looking for a qualified 24/7 electrician? Lakeland, Winter Haven and all of Polk County are within our service area. 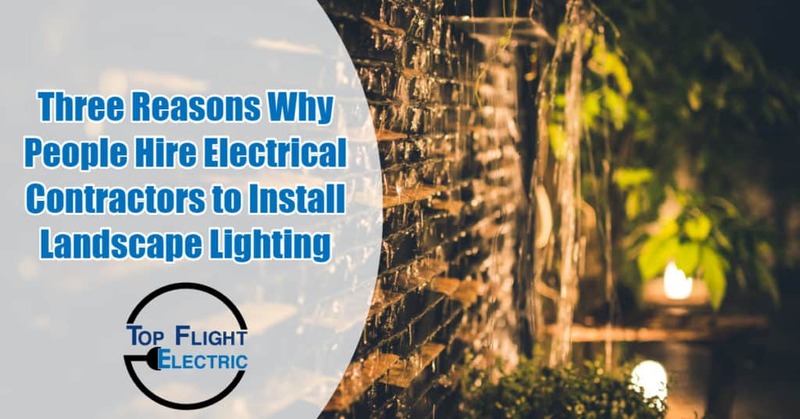 Top Flight Electric is one of the area’s preferred electrical contractors and we stand ready to install gorgeous landscape lighting for you in time for summer. Just give us a call!